Apple set to launch iPhone 6S, new Apple TV and more | What Hi-Fi? Apple is expected to reveal two new iPhones at a launch event this evening, with rumours suggesting they could be joined by a new Apple TV box and a new iPad. Following the monumental success of the iPhone 6 and iPhone 6 Plus, Apple is expected to unveil their successors at an Apple event in California this evening, most likely the the iPhone 6S and iPhone 6S Plus. Also tipped to be revealed are a new Apple TV streaming box, complete with a new interface and dedicated app store, and potentially the iPad Pro, a larger, more powerful iPad. The Apple event gets started at 6pm UK time and we'll be bringing you news of the new products as soon as they're announced, plus hands-on reviews from the launch event. There will be a video stream so you can also watch the Apple event live. It's highly likely Apple CEO Tim Cook will hold aloft two new iPhones on stage on Wednesday 9th September - upgrades to both the iPhone 6 and iPhone 6 Plus. The naming of these is, naturally, unconfirmed but it's likely Apple will stick with tradition and deliver an iPhone 6S and an iPhone 6S Plus. Jumping straight to the iPhone 7 seems a long shot. The biggest of the upgrades is expected to be the addition of Force Touch technology. Force Touch can already be found on the Apple Watch, and the most recent MacBook and MacBook Pro laptops. Essentially, it's a touchscreen that responds to varying amounts of pressure. If it were implemented into the new iPhone, it could mean, for example, a light touch will provide an option menu, while a harder press on the screen will launch an app. Force Touch looks likely to be a key new feature. Other upgrades are expected to include a new aluminium alloy frame, for a stronger build and weightier feel. The new iPhones will likely stick with Full HD 1080p displays, rather than make the jump to 2K that Android phones from LG and Samsung have been making. Given Apple’s track record with Full HD displays, we’re not complaining. The new iPhones could also see a boost in camera megapixels for the first time since the iPhone 4S. Apple could finally ditch the 8-megapixel sensor found in the past few iPhones, and fit a 12MP one instead. Megapixels aren’t everything - as Apple’s 8MP sensor has proved - but 12MP sensors, coupled with Apple’s camera tech know-how, could prove an even stronger combination. We shall see. Under the hood, the new phones are expected to receive a performance boost in the form of a new processor with more RAM. Wireless charging may even show its face after Apple included the technology in the Apple Watch. The most likely new product to join the new iPhone will be a revised version of the Apple TV, Apple’s streaming box. Rumours have already been circulating about a new model being unveiled in September, so we're waiting with bated breath. Updates are expected to include Siri voice control and a new A8 processor chip for improved performance. With the tagline of Apple’s event invitation reading “Hey Siri, give us a hint”, the inclusion of voice control in the set-top box is highly likely. According to reports, the new Apple TV won't support 4K, perhaps a reflection of the lack of 4K content available. However, with Amazon Instant Video and Netflix both now offering some shows in 4K, it would leave the new Apple TV lacking one feather in its cap. Gaming is tipped to be a key feature on the new Apple TV, no surprise perhaps considering the near-30 per cent revenue share Apple takes from sales of games on the App Store. Could the company spring a surprise and reveal a partner with serious gaming pedigree? With rumours swirling around Nintendo's potential involvement, we wouldn't rule it out. It looks unlikely Apple will spring a fully fledged streaming video service to take on Netflix and the rest - and join Apple Music in the company's streaming arsenal - though rumours remain that Apple will launch such a service at some point in the future. But what about the iPad? For some time there have been rumours of an iPad Pro, which would launch with a larger screen and high-end specs. As we've moved closer to Apple's September event, the likelihood of this being revealed seems to have increased with a growing number of well-founded rumours suggesting the iPad Pro could share a stage with new iPhones - in the past new iPads have had their own event. 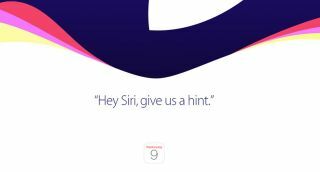 Apple will reveal more details of iOS 9, however, which will likely be released with the new iPhones and the new WatchOS 2 for the Apple Watch. The good news, whether you want to find out what's next from Apple or simply for the rumours to stop (briefly), is that all will be revealed in a matter of hours, with the launch set to start at 6pm UK time.